Basal cell carcinoma is the most common cancer in the world and is related to excessive sun exposure. Basal cell skin cancer usually appears on sun exposed areas such as the nose, cheek, ear, face, neck, or extremities. They usually present as a pink or red bump with a pearly color. They can also present as a flat pink patch on the extremities or trunk. 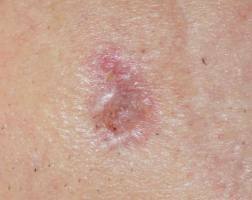 Untreated, basal cell skin cancer will tend to bleed and crust over. Sometimes, they can invade and destroy nearby tissue such as the nose or ear. They are more common in individuals with a fair complexion with light hair and light eyes, but can occur in anyone. Basal cell does not tend to spread quickly but can cause considerable damage to local skin tissue if left untreated. Dr. Seward, Dr. Grattan, and Dr. LaRocque specialize in the prevention, detection, and treatment of skin cancer. They recommend a yearly skin cancer screening for most patients and more frequent skin exams for those patients with risk factors or a history of skin cancer.